The history of what happened almost 180 years ago can often become unclear. People write books and articles with conflicting information. 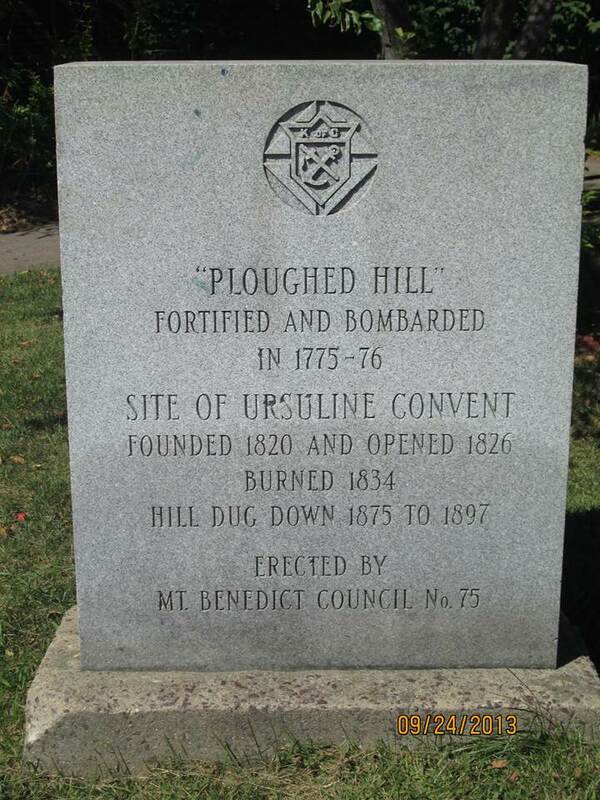 What we know about the burning of the Charlestown convent and school, is that on August 11, 1834 a group of 50-200 men with painted faces, burned the convent and school to the ground. There are reports that 2,000-4,000 spectators including a number of fire companies watched the fire. On August 12, 1834 the men returned to destroy the gardens, orchards and fences. The convent was run by the Ursuline nuns who came from Montreal, Canada. The primary purpose of the convent was to educate young women. 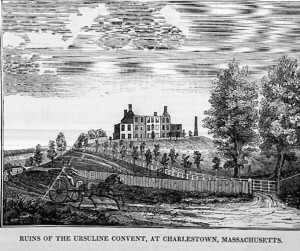 The Charlestown Convent was used mostly by the daughters of the Protestant upper classes. At the time the convent had 41 Protestant girls and only 6 Catholics girls. Her direct threat did not have the desired result. There were also conflicting reports that a girl named Rebecca Reed was held in the convent against her will and a second report that Sister Mary John, a nun teaching at the convent came upon Edward Cutter asking for help getting to West Cambridge. Cutter reported that the nun was agitated, so the following day he went to the residence to ask why Mary John had left the convent. He was informed she had returned to the convent. Mr. Cutter went to the convent and spoke with Mary John, who said she could leave anytime. 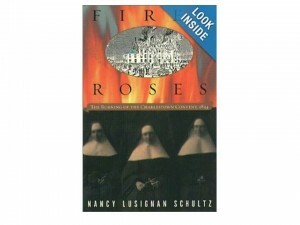 The rioters seemed convinced that a mysterious lady was being held against her will by the catholic nuns. 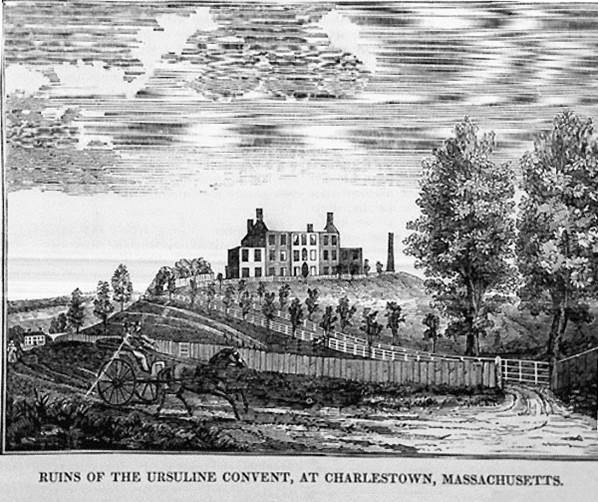 Learn more about what happened on a hill overlooking Charlestown behind Sullivan Station 180 years ago. What happened to the ring leaders? 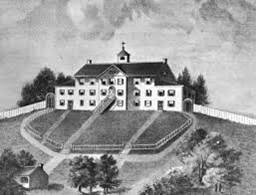 Why wasn’t the Convent and school rebuilt? What happened to the Mother Superior? 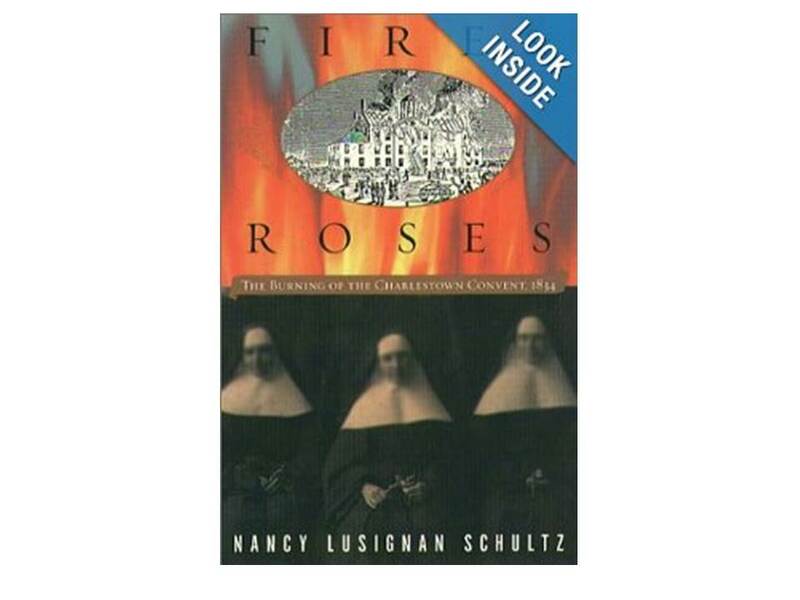 Attend the presentation by Nancy Lusignan Schultz, author of Fire & Roses: The Burning of the Charlestown Convent, 1834, on Tuesday October 15, 2013 at the J. W. Conway Bunker Hill Post 26 of the American Legion, 23 Adams Street at 7:00 pm to 8:00 pm. Sponsored by the Charlestown Historical Society. For a community of relatively small size and population, Charlestown, Massachusetts has been home to an amazing number of historic “firsts” over the centuries since its founding in 1628. The fact that Charlestown was home to the first passenger elevator in America was brought to the writer’s attention, in his capacity as Historian of the Charlestown Historical Society, by the British author of Robertson’s Book of Firsts-Who Did What for the FIRST TIME. In this impressive and fascinating tome, published in 2011, Patrick Robertson reports the results of 50 years of research into what, when, and where a multitude of objects, occupations, institutions and practices came into being or use for the first time in history. In his book’s current first edition, Robertson identified America’s first passenger elevator as being that “supplied by Elisha Graves Otis for the five-story building of the E. V. Haughwout department store on Broadway, in New York City, on 23 March 1857 at a cost of $300.” Subsequent to publication, an alert reader informed Robertson of another American passenger elevator that antedated New York City’s Otis elevator. 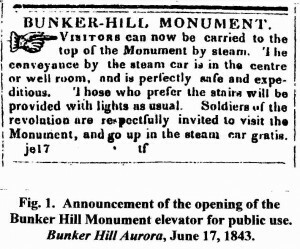 That earlier elevator was installed in the Bunker Hill Monument in Charlestown and opened for public use on the Monument’s dedication day, June 17, 1843, a fact attested to by Figure 1 showing a news item appearing in the Charlestown newspaper, the Bunker Hill Aurora, of that date. Seeking to learn more about the Monument’s elevator, Robertson sent a request for information to the Charlestown Historical Society. As the Society’s Historian, the writer’s research undertaken on the subject produced the following findings. 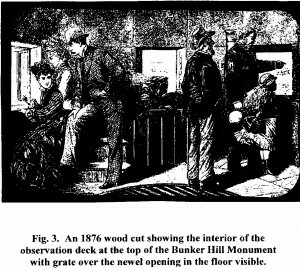 Unhappily, despite its extraordinariness, the Monument elevator was not well-documented in the period of its existence, leaving many missing details open to assumption and conjecture as will be seen in the text. In 1823, a number of prominent men of Boston and Charlestown, wishing to memorialize the American militiamen who fought and died at the Battle of Bunker Hill on June 17, 1775, formed the Bunker Hill Monument Association. Their goal was to create a fitting monument to those patriotic farmers and townsmen who proved themselves a match for the British Army, the mightiest military force in the world of that day. 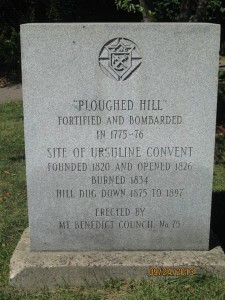 While the Americans lost the battle due to running out of ammunition, the number of casualties they inflicted on the British caused their commander, General Thomas Gage, to write, “The loss we have sustained is greater than we can bear.” The British never came out of Boston to do battle again. A design competition produced a winning Monument design consisting of a granite obelisk 220-feet high containing an observation deck at the top reached by a winding granite stairway. The cornerstone was laid with Masonic ceremony on June 17, 1825 in the presence of the Marquis de Lafayette and Daniel Webster who gave the oration. The Monument, however, was not completed until 1842, 17 years later, due to construction progressing in fits and starts as money ran out time after time and needed replenishing by public subscription or, at one point, the sale, for house lots, of a large portion of the Bunker Hill battleground previously purchased by the Monument Association. Finally, in 1840, money raised by a “Ladies Fair,” inspired by Ladies Magazine editor Sarah Josepha Hale, combined with large contributions by two wealthy benefactors, Judah Touro and Amos Lawrence, provided the funds needed to complete the Monument, at that time stalled at the 85-foot level. Here enters the creator of America’s first passenger elevator, James Sullivan Savage, a skilled, creative and enterprising construction contractor who agreed to finish the Monument for a fixed contract price of $43,800 that matched the funds raised. Construction was made more efficient by an innovative derrick designed and patented by Savage and powered by a six-horsepower steam engine that was used for raising the massive granite blocks. Under Savage’s competent direction, the Monument was completed in just over a year. Renewed construction began on May 2, 184 1. The pyramidion capstone was put in place on July 23, 1842. 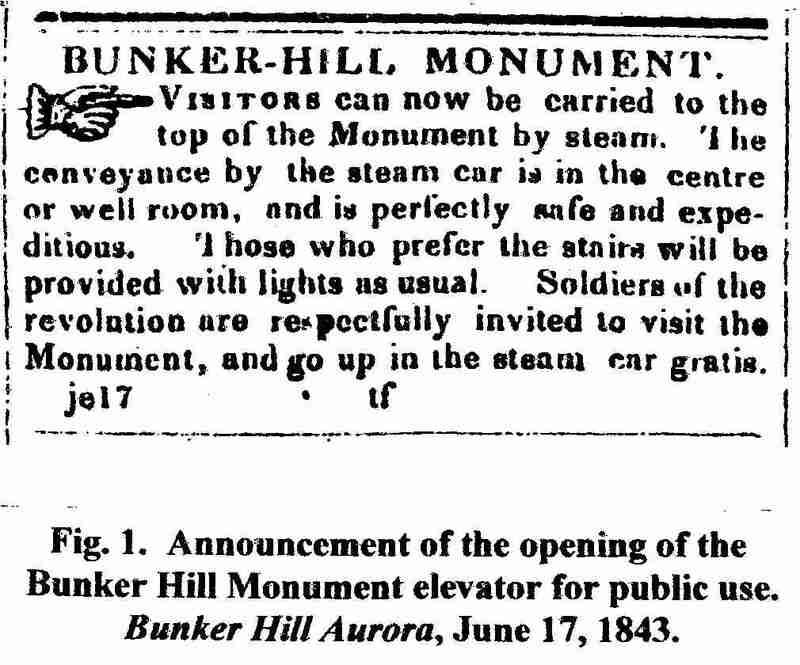 The Monument Association, however, delayed the monument’s dedication until June 17, 1843 to coincide with the 68th anniversary of the Battle of Bunker Hill. Savage put the delay to good use. Reasoning that few people would welcome the climb up the 294 steps of the winding granite staircase to the observation deck at the top of the monument, Savage came up with the concept of using his steam engine to power an elevator that would raise passengers up through a circular void or shaft in the center of the Monument known as a “newel.” The newel’s smokestack-like circular walls support one side of the staircase that winds around it. The opposite side of the staircase is supported by the outer walls of the Monument. The observation deck was a popular destination. Available from its four windows were sweeping panoramic views of Boston, Charlestown, and the surrounding territory out to the distant horizon. To reimburse his costs, the Monument Association allowed Savage to charge 20-cents for an elevator ride up the Monument and 12 1/2-cents for stairwell users. 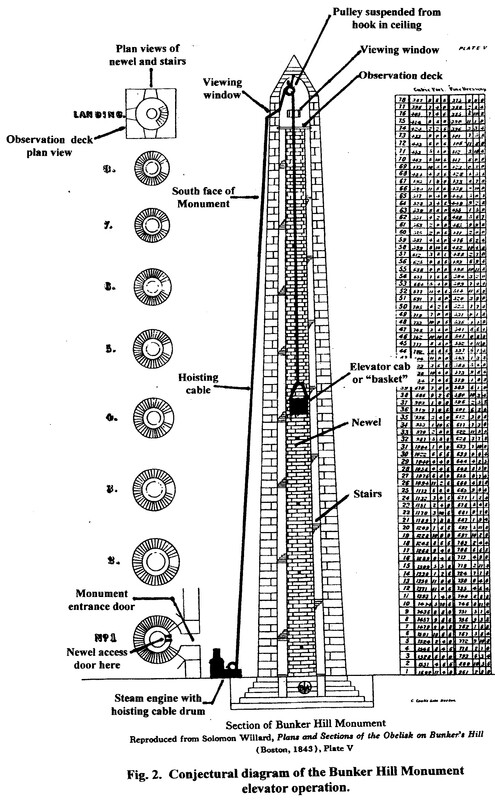 Figure 2 shows a conjectural view of Savage’s clever rigging of the elevator’s mechanism, a marvel of elegance and simplicity. The elevator’s power source was the same steam engine used to operate the derrick that lifted the dressed granite blocks up the Monument and into place during construction. 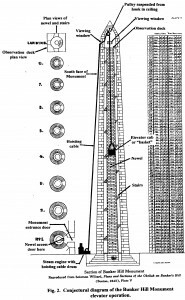 For the elevator, the steam engine turned a drum around which was coiled the cable used to raise and lower the elevator cab. 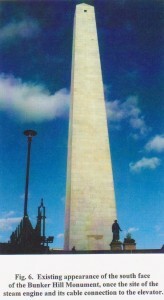 The cable stretched up the south face of the Monument and in through the south viewing window of the observation deck. From there, the cable traveled up and over a pulley supported by a hook in the observation deck’s ceiling. The hook is still there and visible. From the pulley, the cable extended down through a round hole in the floor of the observation deck that opened into the newel shaft and connected to a framework supporting a passenger-carrying cab described in contemporary accounts as a “basket.” Use of this term suggests that the basket resembled the gondola of a hot air balloon. It was probably round, matching the shape of the newel shaft. 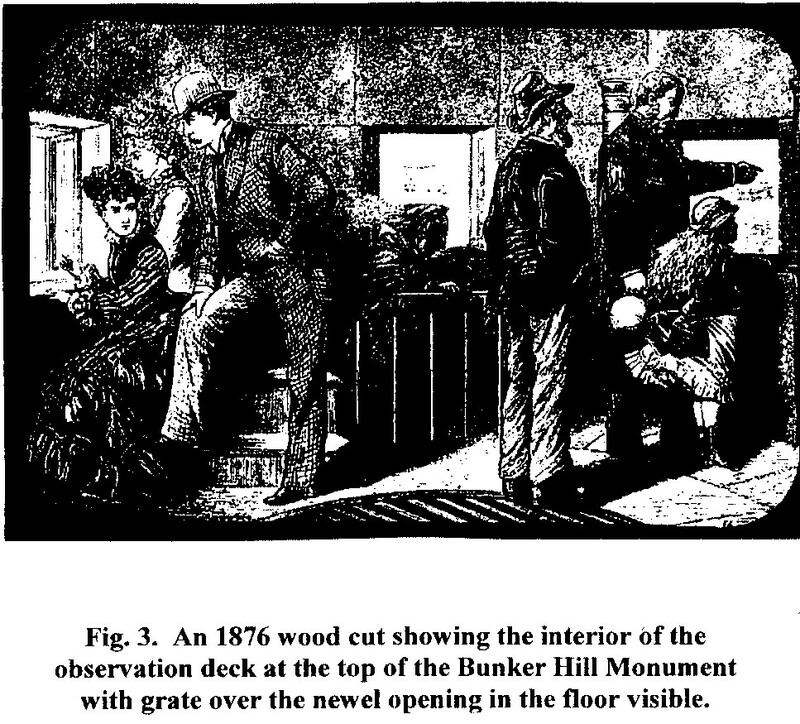 The opening to the newel shaft in the floor of the observation deck is visible in Figure 3, an 1876 wood cut. 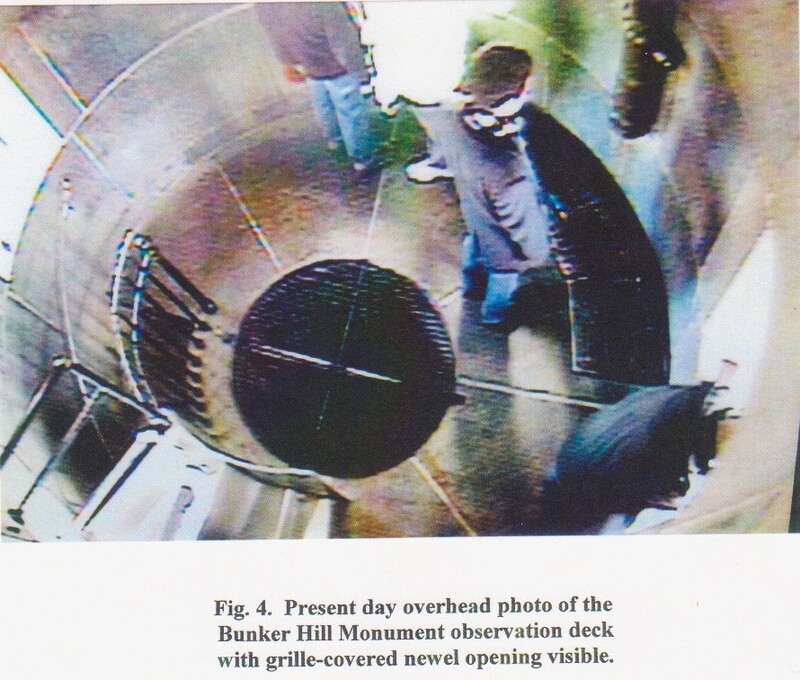 The newel opening was then and continues to be covered by a grate or metal grille as seen in Figure 4, a present-day photograph of the observation deck taken by a security camera installed in the ceiling. Since the newel shaft narrows as it ascends, being about 6-feet wide at the base and narrowing to about 4-feet wide at the observation deck level, it would appear that passengers in the basket probably rode standing and holding onto some portion of the basket’s supporting framework. One account says as many as 6 people could crowd into the basket. Passengers boarded the basket at the bottom of the newel shaft through a doorway in the newel just opposite the entrance door to the Monument’s interior. The Figure 5 photograph shows the newel access door as it appears today. Visible through the door is a small-scale marble replica of the Tuscan-style memorial pillar honoring Provincial Congress President, Major General, and Freemason Joseph Warren who was killed in the waning moments of the Battle of Bunker Hill. The original pillar, made of wood and brick and topped by a gilt urn finial, was placed on the battle site by fellow Masons of Charlestown’s King Solomon’s Lodge in 1794. It deteriorated over time, leading to its removal by the 1840’s. The occupants of the ascending basket, once it had emerged from the newel shaft hole in the observation deck’s floor, simply stepped out of the basket, perhaps via a gate in its side. The newel hole probably had some sort of railing around it to prevent anyone from falling into it while the basket was being raised and lowered. Attendants would be necessary at both the top and bottom of the shaft to assure safety, collect admission fees, assist passengers into and out of the basket, and send signals to the steam engine operator via the same bell-wire signaling system used for derrick operation during the construction period. The elevator operated for only about a year. The Monument Association terminated its operation in mid-to-late 1844 on the basis that the hoisting cable running up the side of the Monument and the steam engine at its base were “marring the beauty of the Monument.” Figure 6 shows the beauty of the south face of the Monument as it appears today, sans cable and steam engine. 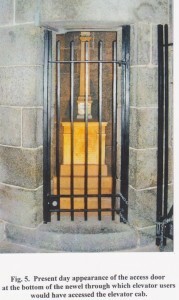 An ulterior motive for the termination may have been the request of King Solomon’s Masonic Lodge to install the aforementioned Joseph Warren memorial pillar in the base of the newel, visible through its access door, where it rests today. Other than adverse appearance and, possibly, the negative effects of the noise and smoke emitted by the steam engine on the neighborhood quality of Monument Square, progressively developing into an elegant and fashionable residential venue for Charlestown’s wealthiest citizens, Savage’s elevator was, in all other respects, extremely successful. Its modest admission fees produced a level of profits that amazed the Monument Association, allowed Savage to recover his start-up and operating costs, and paid for the installation of granite walks and iron fencing on the Monument grounds and a brick sidewalk surrounding the whole. Last, but by no means least, the Monument elevator, during its brief life, was an enormous boon to all those unable or unwilling to climb the 294 steps to the Monument’s top, including those “Soldiers of the revolution …respectfully invited to visit the Monument and go up in the steam car gratis.” Going up! George Washington Warren, The History of the Bunker Hill Monument Association, Boston, 1877; Solomon Willard, Plans and Sections of the Obelisk on Bunker’s Hill, Boston, 1843; E. H. Cameron, Of Yankee Granite An Account of the Building of Bunker Hill Monument, Boston, 1953; Thomas F. Mahlstedt, Historical Archeology at Bunker Hill Monument, Washington, D.C., 1981; National Park Service, The Construction of the Bunker Hill Monument, undated leaflet; National Park Service, What? No Elevator? And Other Facts About Bunker Hill Monument, undated leaflet; Bunker Hill Aurora, Charlestown newspaper, Edition of June 17, 1843; Patrick Robertson, Robertson’s Book of Firsts, New York, 2011; National Park Service Ranger Vincent Kordack, Interviews on various dates, 2011-2013.